DO YOU FEEL DEEPLY ABOUT LIFE? DO YOU ENJOY DISCOVERING NEW AND INTERESTING IDEAS? ARE YOU ALWAYS LOOKING FOR HIGHER MEANING AND INSPIRATION? Nobody knows better than you where you will find meaning, but there are places that you're likely to encounter it. 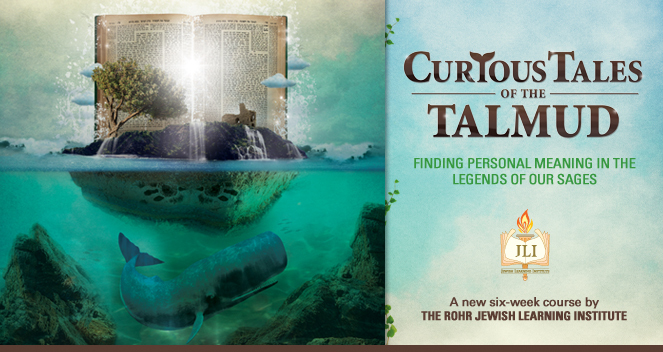 Our newest JLI course, Curious Tales of Talmud: Finding Personal Meaning in the Legends of our Sages, will introduce you to a legendary world of insight that has fascinated scholars and mystics for millennia. Judaism is full of deeply resonant and transformative wisdom. Some of its most profound ideas about life, the universe, the soul, and our relationship with G-d are encrypted in an unusual place-within peculiar and nonsensical Talmudic tales. The Talmud's zany legends tell of gargantuan sea creatures, vinegar-fueled lamps, idolatrous kings, rivers flowing upstream, and a debate of riddles between Jewish and Athenian sages. These intriguing legends are not usually accessible to the general public, nor are the profound pearls of wisdom that are encrypted within them. Now you have the opportunity to take this amazing journey for yourself-an adventure to unravel layers of personal meaning as we decode these mysterious tales together. This fascinating new course addresses many challenges that we face with the ups and downs of life, and how to overcome deep-rooted, undesirable tendencies. Curious Tales of the Talmud provides access to a deeper dimension of yourself, the insight to appreciate goodness within everything, and a reservoir of courage to navigate life's most rugged moments. You're also likely to encounter a newfound appreciation for your Jewish literary heritage. An island turns out to be the back of a mammoth sea creature, oceanic waves rise miles high, and an encounter with the"dead of the wilderness:" Rabbah bar bar Chanah's strange parables hold the secret to Jewish survival and offer powerful tips on how to rise above life's challenges. G-d prayed, sinned, and even requested a blessing from a human being. Talmudic anthropomorphisms highlight the importance of vulnerability in relationships and how being vulnerable shapes the character and essence of our relationship with G-d. The lessons of a vinegar-fueled lamp; singing toddlers; and a tale of a king, a sage, and a dream affect how we judge others and help us to find purpose in our nation's exile and within all that transpires in our lives. A snake's gestation period, a butcher's head for sale, and how to mend a broken millstone are just a few of the paradoxical riddles in a battle of wits between Jewish and Athenian sages, presenting profound intellectual challenges to the fundamentals of our faith. After exhausting his arguments, Rabbi Eliezer makes a carob tree jump, reverses a stream of water, crumbles the walls of the study hall, and evokes a heavenly voice, all to make a point. What is so important about Rabbi Eliezer's message? How is it relevant to us today? How can a small donation surpass a lifetime of life-risking devotion? Illogical rates at a"rent-a-donkey" location and a royal dispute about sheep and goats teach us the dangers of stagnation and suggest a path to radical growth. you so much insight and personal meaning like JLI's Curious Tales of the Talmud. It's a wonderful opportunity and I hope you will attend. by His word created the world, study aggadah" (Sif. Deut. 49). heritage of Judaism to new generations of Jews in an engaging and delightful way. sages, as relevant today as it was when they were first told.